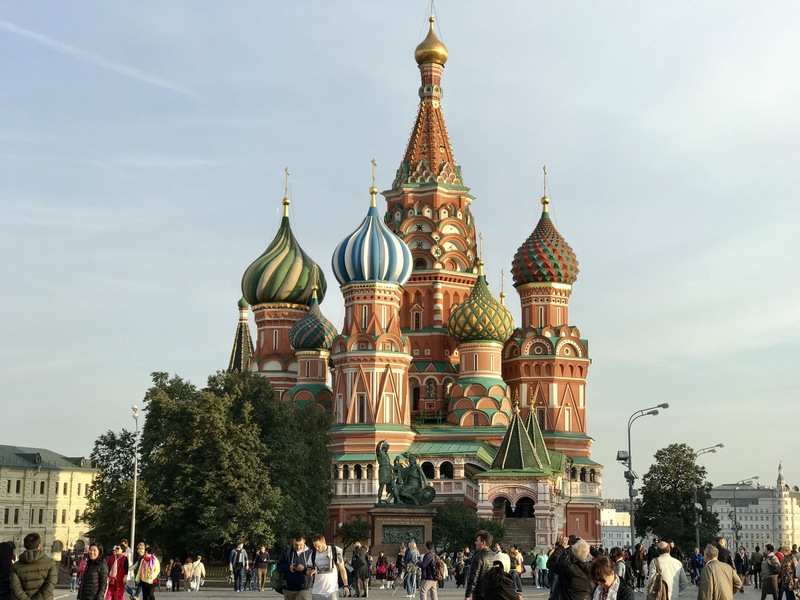 Moscow’s Red Square is one of the most recognizable places in the world, and dominating its southern end is the landmark St. Basil’s Cathedral, the 16th century monastic structure that millions can easily identify from even a photo. But to actually stand in front of it for the first time and even enter and explore as I just did a few weeks ago was a lifelong dream and will also be a lifelong memory. 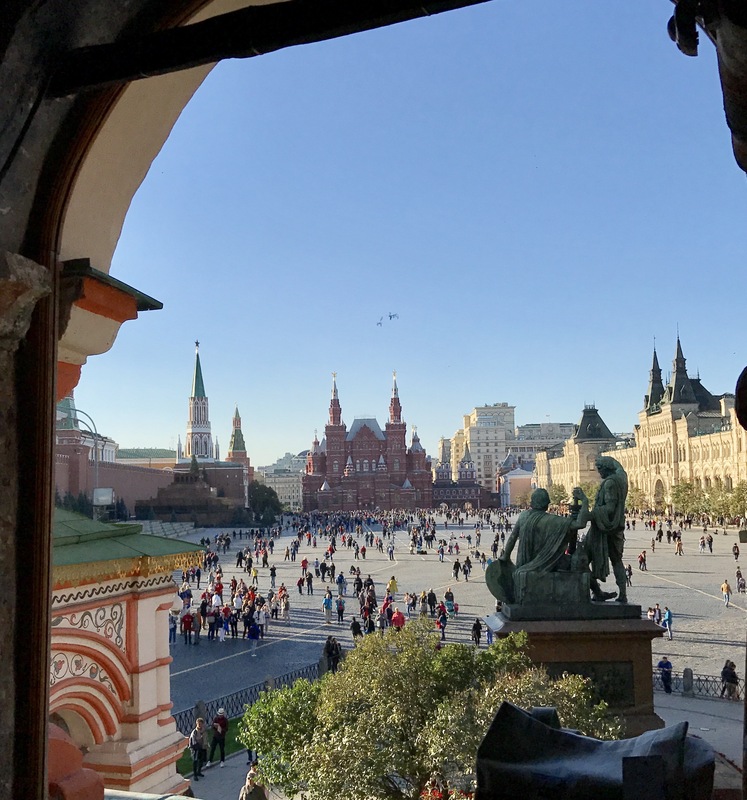 Seeing it first through the Resurrection Gate adjacent to Red Square’s Kremlin’s wall is an exciting promise of living history. Red Square isn’t a leftover name from the Soviet Era because “red” (krasniya) has been applied to this place for hundreds of years since it means both “red” and “beautiful”. Red Square – Moscow’s old marketplace – is deservedly a UNESCO World Heritage site since 1990. 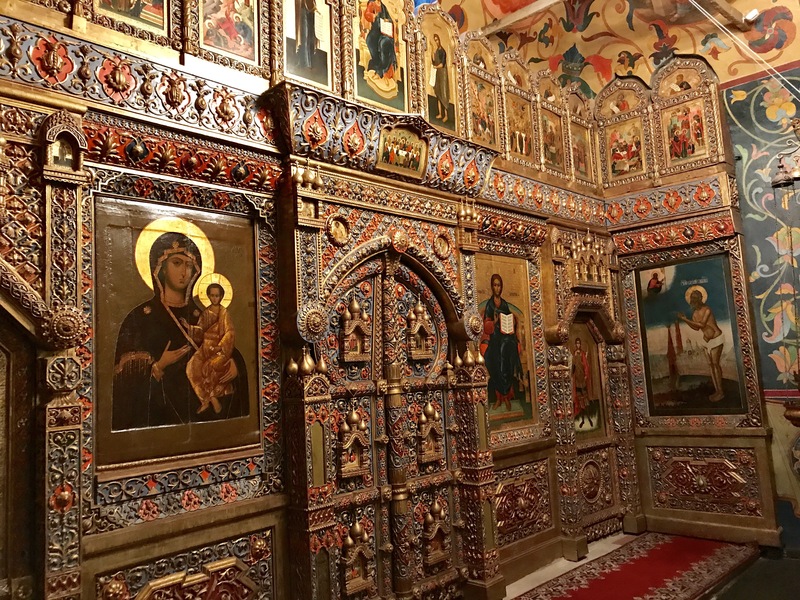 The official church name (actually a complex of 10 chapels) is both St Basil the Blessed as well as the Cathedral of the Intercession of the Most Holy Theotokos on the Moat; another name is Pokrosky Cathedral. One of the complex of churches on the site, the tenth is built over the grave of St. Basil. 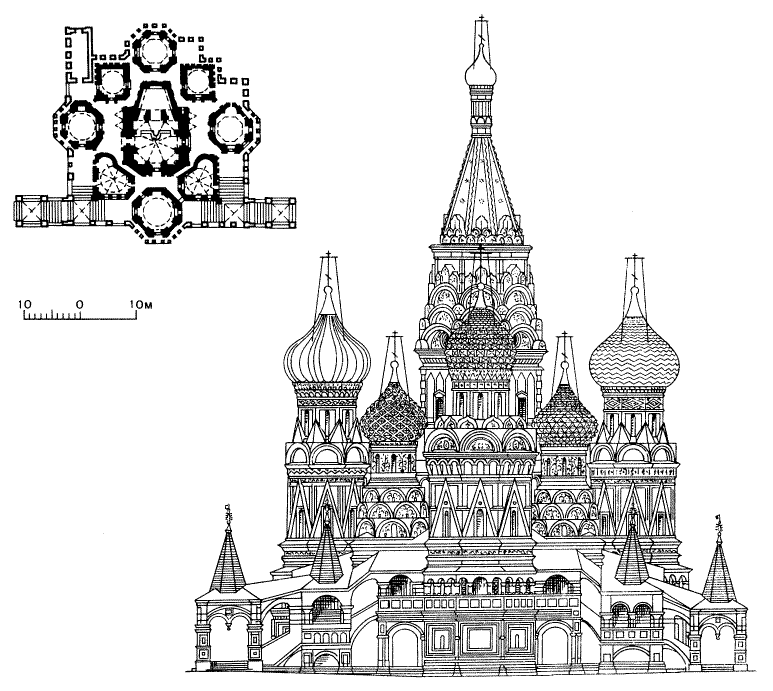 The original church of the Trinity was a growing of eight chapels around a ninth (Intercession) and built between 1555-61 to memorialize victories of Tsar Ivan the Terrible (1530-84) over the Kazan Khanate and the capture of Kazan and Astrakhan in 1552. Not the first holy building on the site, St. Basil’s is now a museum, having survived the Soviet destruction of holy places even under Stalin who knew how cherished it was to Muscovites. Stalin made it a secular institution in 1929. While the architect is officially unknown, some documents suggest that is either one or two men known as Barma and Postnik, although this may reference the same man also known as Postnik Yacovlev. Popular legend claims that Tsar Ivan the Terrible had the architect blinded so he could not reproduce this famous church anywhere else. Who was St. Basil and why is he associated with this colorful multiple onion-dome towered church? St. 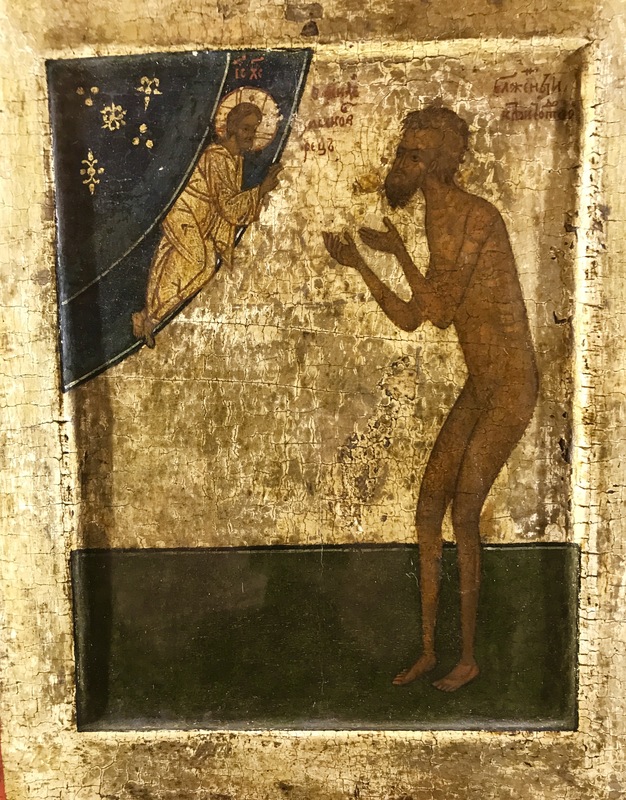 Basil (Vasily) was a local mid-15th c. mystic and ascetic born in nearby Yelokhovo (now within Moscow) eventually known as a miracle-worker and yurodivy or a “holy fool for Christ”. Eccentric to the extreme for eventually going around naked even in winter and wearing heavy chains while excoriating the rich, he was first a young shoemaker who began to steal from the wealthy and gave to the poor in order to shame Muscovites for their indifference to needy Russians. He even publicly condemned Tsar Ivan the Terrible, who after Vasily died in 1552, became one of his funeral pallbearers and oversaw his canonization in the Russian Orthodox Church, an event celebrated around 1580. St. Basil’s Cathedral has an astonishing array of different domes whose bright colors and shapes most likely make it the most singular landmark of Russia and a common internal surprise feature of modern Faberge-style eggs and even Christmas ornaments. The most beautiful Christmas ornament I’ve ever seen is an ornate glass model of St, Basil’s, which I found in St. Gallen Cathedral Square a few years ago but felt was too fragile to bring home one summer because I had just started a trip in the Alps and would be backpacking for weeks. I hope I can find this ornament again now that I’ve been to St. Basil’s. 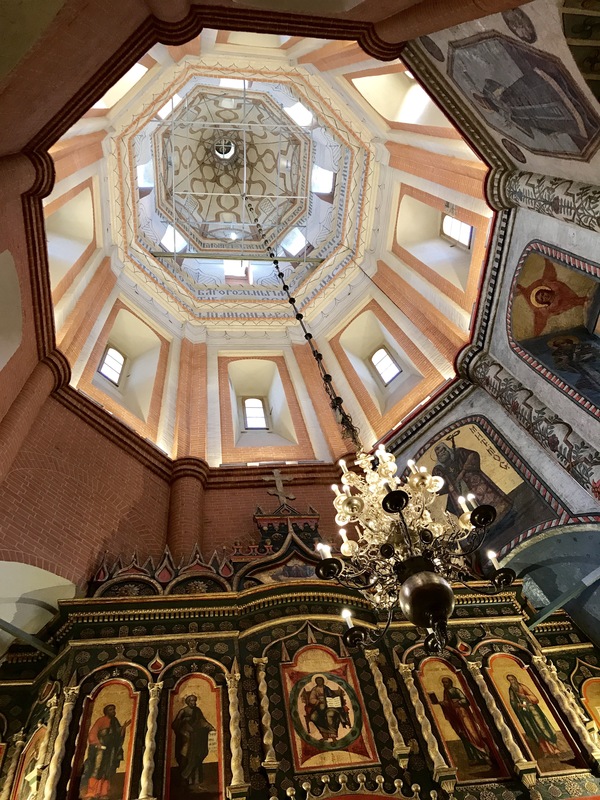 I even heard a week or so ago the Russian Orthodox Music acapella quartet Doros singing under one of St. Basil’s domes. It was the some of the most lush vocal polyphony I’ve ever heard and perfect for the cathedral space where the acoustics were so well suited for it. Some of these moving hymns were likely sung in St.Basils since its 16th century founding.